Since last October I've been arguing that the equity selloff had more to do with a "panic attack" than to any serious deterioration in the economy's fundamentals. Waves of worry (e.g., a China economic slowdown, tariff wars, Trump's unpredictability, a weakening Eurozone economy, stumbling emerging market economies, collapsing oil prices, weaker corporate earnings, rising credit spreads, and Fed tightening) converged into a "perfect storm" just before Christmas, causing the S&P 500 to fall almost 20% from its late-September high. 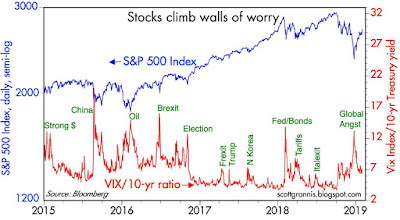 Since then, the "worry headwinds" have abated. Oil prices are up almost 28%. 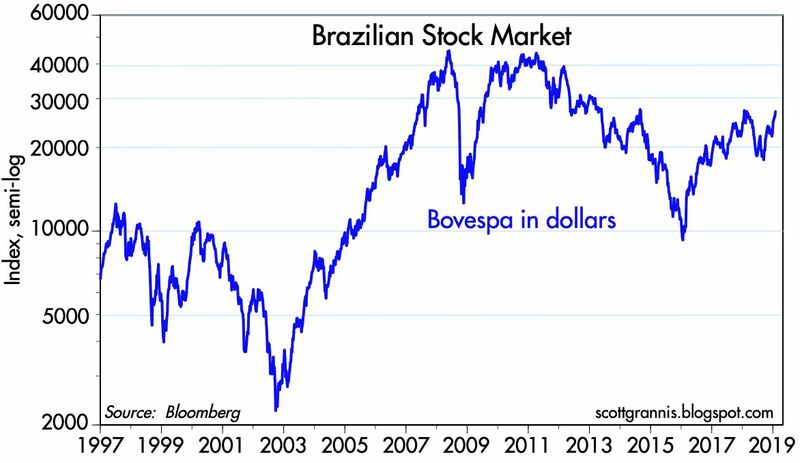 Emerging market economies have bounced (the dollar value of Brazilian stocks is up almost 25% in the past 5 weeks). Commodity prices have firmed. 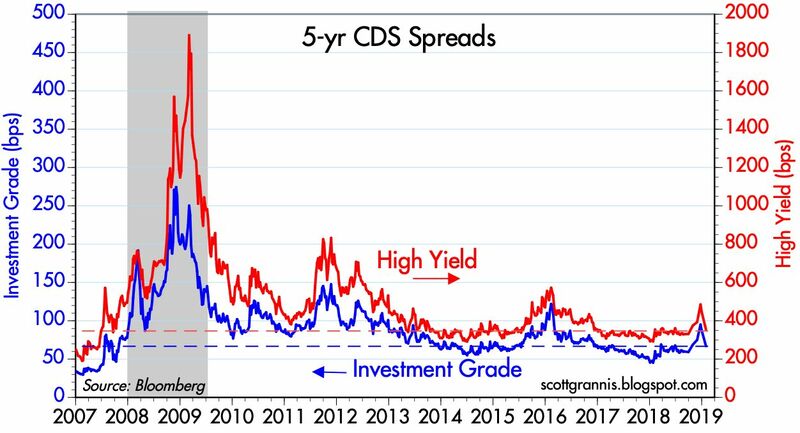 Credit spreads have tumbled. Corporate profits have firmed. Key financial fundamentals in China are improving (the MSCI China index is up 14%). And the S&P 500 has rallied some 15%. One big reason for the improvement: Yesterday the Fed reiterated in detail the apology it made earlier this month. The Fed no longer expects to raise rates twice this year. Instead, Powell has promised to wait for a reason to tighten (e.g., rising inflation, which to date remains very much under control). Shrinking the Fed's balance sheet has morphed from being on "autopilot" to now flexible, a very reassuring sign for future market liquidity conditions. In short, the Fed is paying attention to its dancing partner (the market), and everyone is happier. The bond market doesn't see the Fed doing anything for the foreseeable future. Inflation expectations are in the sweet spot (1.7% per year over the next 5 years). The yield curve is doing just fine. 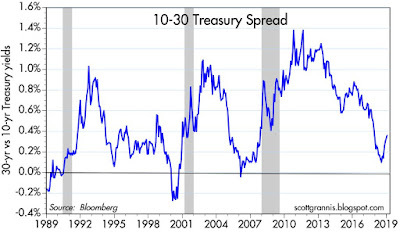 Another big, but under-appreciated reason: Liquidity has been abundant in the U.S. financial market, as reflected by low and stable swap spreads—a fact that I've been highlighting consistently. Liquid financial markets are a major antidote to financial panics, since they allow market participants to quickly and easily alter their risk exposure as their appetite for risk changes. Put another way, liquid financial markets act as a shock absorber for the real economy. 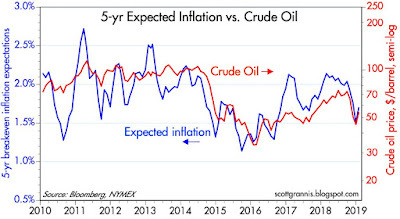 Chart #1 shows how big changes in oil prices affect the market's inflation expectations. Currently, the bond market expects CPI inflation to average 1.7% per year for the next 5 years. That's a bit below the Fed's "target," but it is nothing to worry about. In my book, lower inflation is always better. 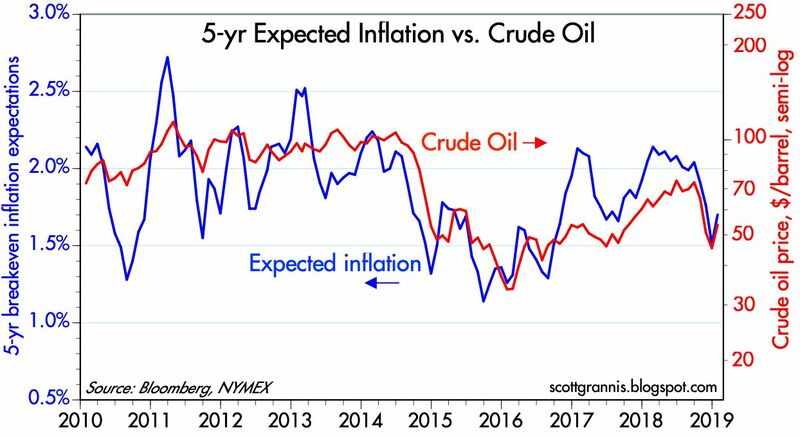 Meanwhile, the recent bounce in oil prices dampens concerns about the solvency of oil producers, and it is also evidence that the Fed is not too tight, nor is it expected to be too tight. 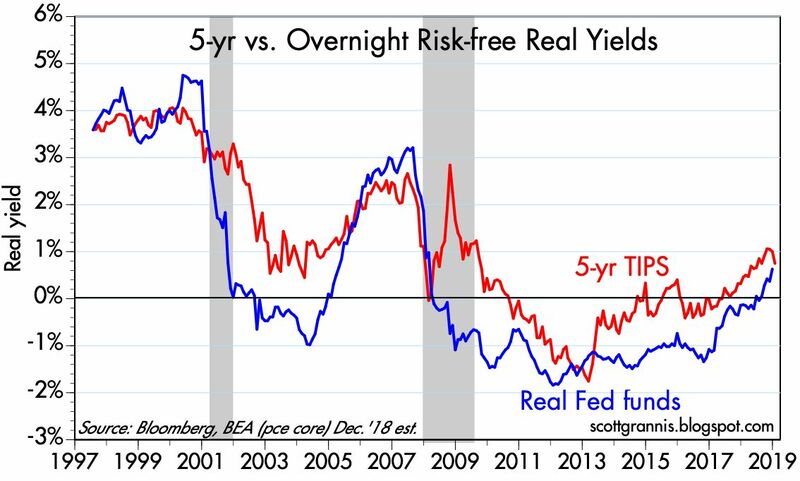 Chart #2 compares the real Fed funds rate (blue line) to the market's expectation for what the real funds rate will average over the next 5 years (red line). In the wake of the Fed's apology, the market now assumes the Fed is going to be in "pause" mode for an extended period. This makes sense if you don't expect economic growth to pick up meaningfully from the 2-2.5% range we've seen over the past decade. However, if the economy performs better than that—something we won't know for sure for at least the next 3-6 months)—then it's very likely that real interest rates will rise and that will require the Fed to adjust nominal rates upward from current levels. In the meantime, I take this to mean that the market is not very optimistic about the economy's ability to strengthen from "new-normal" rates of growth. 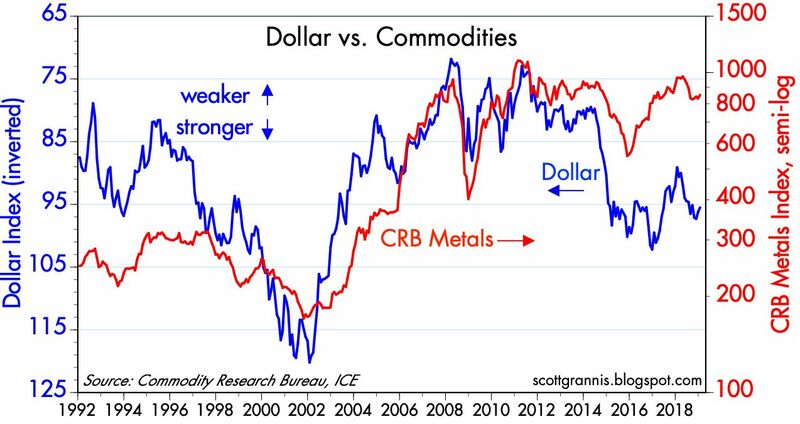 Chart #3 compares the value of the dollar (inverted) to the level of industrial metals prices. Over time there has been a strong inverse relationship between the two. 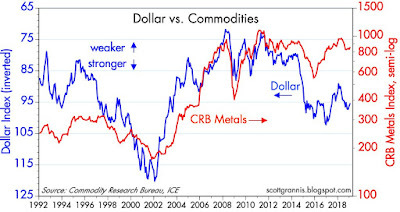 In recent years, however, commodity prices have held up very well despite a noticeable strengthening of the dollar. This suggests to me that the global economy is, and remains in, fairly good shape. 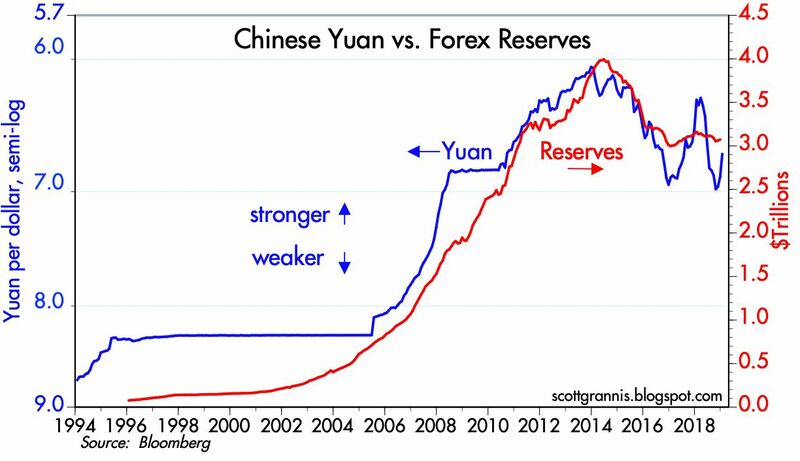 It also is evidence that the Fed is not so tight as to artificially push up the value of the dollar. The dollar is relatively strong not because money is tight, but because the outlook for the U.S. economy is better than that for most other major economies, and that's a good thing. Chart #4 shows the dollar value of Brazilian equities. As with the case of most emerging market economies, tight U.S. monetary policy and a strong dollar (which prevailed in the late 1990s and early 2000s) pose substantial risks, since those two factors combine to crush the prices of the commodities on which those economies depend. Today that's not the case. At the same time, Brazil is enjoying a new, more market-friendly government. Emerging market economies appear to have substantial upside potential. 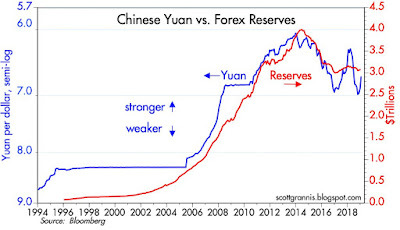 Chart #5 provides evidence that the Chinese central bank has managed to stabilize the value of the yuan (blue line), while at the same time arresting the outflow of capital which threatened China's ability to grow. Forex reserves (red line) are basically a barometer of net capital flows, which have been close to zero for the past few years—after being very negative from mid-2014 through late-2016. The recent rise in the yuan is likely an indicator that the market senses a U.S.-China trade truce in the offing. Since their late-October lows, the yuan has appreciated 4% and the MSCI China index is up some 3%. Baby steps, to be sure, but at least they are moving in a positive direction. The front end of the Treasury yield curve has been pretty flat in recent months, a reflection of the market's belief that the economy will grow at a moderate pace and the Fed will remain on hold for an extended period. But the long end of the curve, shown in Chart #6, is nicely positively-sloped. This is reminiscent of the mid-1990s, when the Fed was non-threatening and the U.S. economy was picking up speed. It's a healthy sign of long-term growth prospects. Chart #7 is one of the most important. 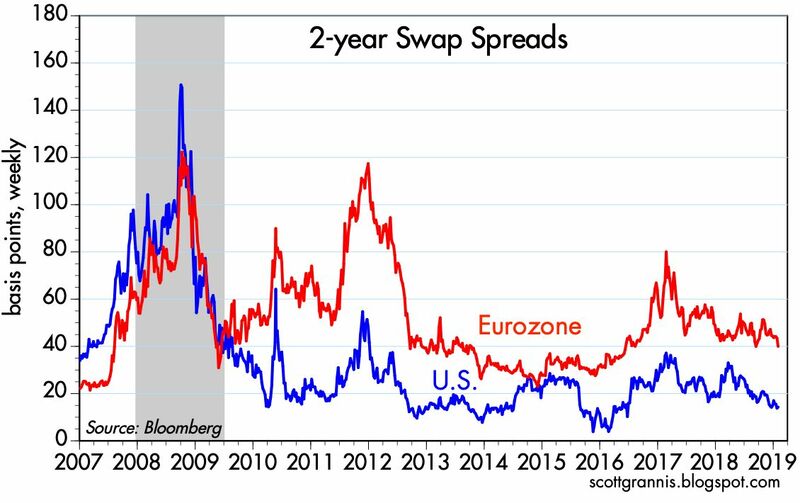 Swap spreads in the U.S. have been rather low for a long time, and this is a reflection of healthy liquidity conditions, low systemic risk, and a non-threatening Fed. 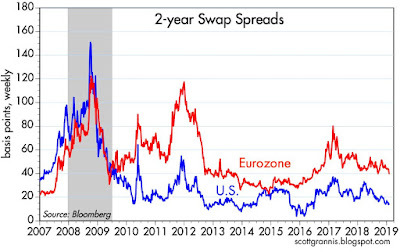 It's nice that Eurozone swap spreads have been moving lower of late, especially given the pronounced weakness we've seen in Europe in the past year. 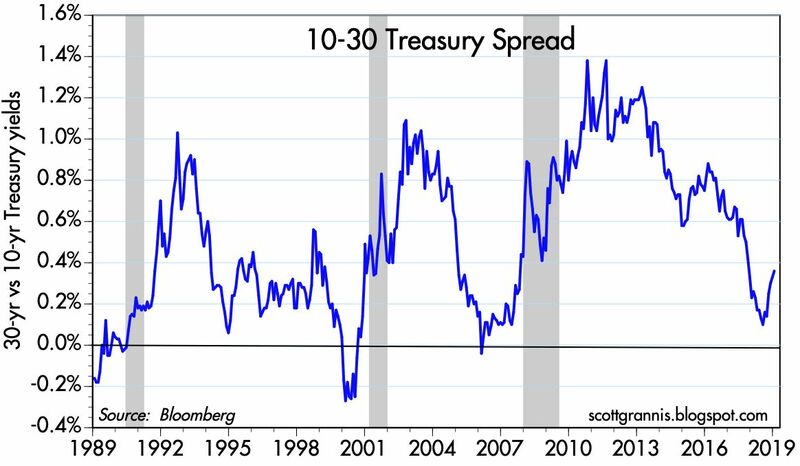 As I've emphasized for many years, swap spreads tend to be excellent coincident and leading indicators of economic and financial market health. 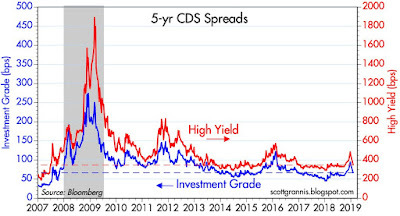 Credit default swap spreads are a highly liquid and generic indicator of the market's outlook for corporate profits and the future health of the U.S. economy. They have fallen significantly since just before Christmas, suggesting in turn that the market has become much less worried about the future. The trailing 12-month earnings yield on the S&P 500 is now a rather robust 5.5%. 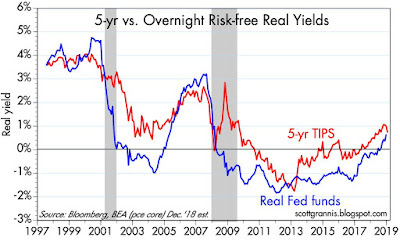 That is about 2.9 percentage points higher than the current 2.6% yield on risk-free 10-yr Treasuries. 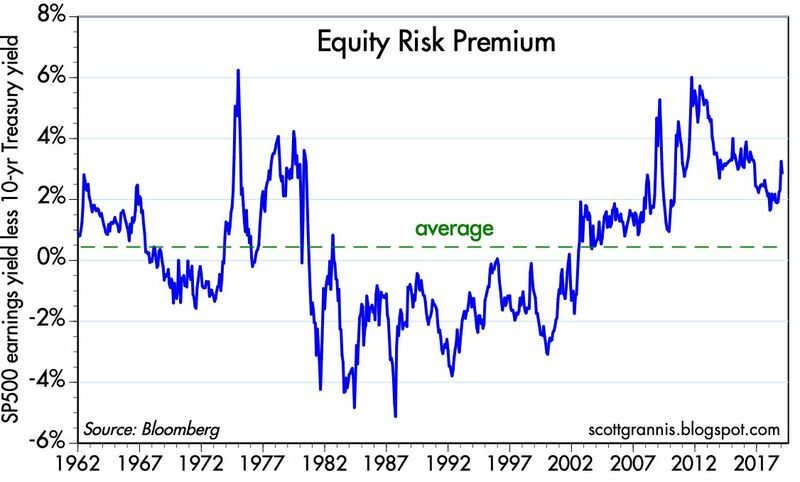 As Chart #9 shows, the extra yield on stocks is relatively high when viewed from a historical perspective. This is a sign that the market is still priced to a skeptical view of the ability of corporate earnings to continue rising. 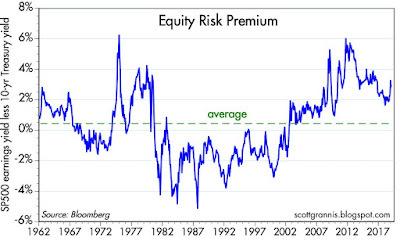 The market has lost a good deal of its former fear, but it's still far from being optimistically-priced. 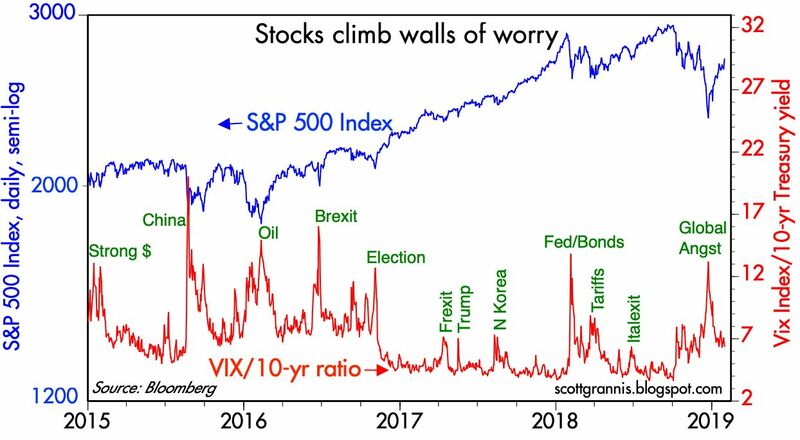 Chart #10 shows how surging bouts of fear (panic attacks, red line) have coincided with equity selloffs (blue line), and how receding fears lead to rising stock prices. It's not yet possible to be confident that the recent selloff was just another panic attack, but it's looking that way for now. I wonder if Scott and Marcus both got a hug today since it is "Hug and Economist Day"? I am glad the Fed finally saw the light. Inflation is yesteryear's boogyman. It will be interesting to watch central banks going forward. The Bank of Japan is well below its inflation target, despite having 161 job-openings for every job hunter in Japan, and buying back 45% of that nation's huge hoard of JGBs. Europe inflation is dead. China is below target. The US is below target. If central banks do not over-tighten, we might have a few more years of slow growth. Central bank balance sheets? The ECB has no plans to sell off bonds, The Bank of Japan is still adding bonds. The Fed would be wise to standstill too. The real question is how to boost aggregate demand. It may be that money-financed fiscal programs are the answer. Really strong jobs number despite shutdown. NOW investors will renew their fret re the FED and rate increases. That said, we're seeing a strong economy without the resultant expected inflation. I maintain that technology keeps a lid on inflation much more than the dopey FED. Re: "The real question is how to boost aggregate demand." No, because demand cannot appear out of thin air. Suppy-siders have it right: supply creates its own demand. The real question is how to boost investment; more investment leads to more jobs, more production, more incomes, and finally to more demand. Investment has been slow to materialize, despite big tax cuts. I think the reason for the sluggish increase in investment is all the uncertainties that have plagued us: China, tariff wars, Trump, Eurozone weakness, etc. These now appear to be diminishing on the margin, which means we ought to see a pickup in investment—and thus demand—by summer if not before.